Pacifique Studios is home for many well-known artists/musicians, producers and mixers. Most recently Shakira was in the house to put finishing touches on her upcoming album -- Oral Fixation 2 will be re-released on March 28 - Hips Don't Lie (featuring Wyclef Jean) was mixerd by Serge Tsai at pacifique. His royal highness, The Prince was at the studio for his new album with mixer Ian Boxille. Beyonce came to the studio to get a regatone mix of "check up on it" with Dexter Simmons. This track is for Destinys Child and Bama Boys release on multi-platinum-selling pop/urban diva's label, Music World. 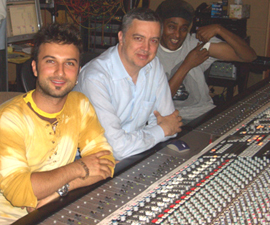 The middle eastern Pop Sensation, Tarkan was also recently at Pacifique Mixing his English album with Dexter Simmons. Established in 1984 by Joe, Ken and Vic Deranteriasian, Pacifique is a two-room facility in the heart of NoHo district in North Hollywood, California boasting clients the likes of: Christina Aguilera, Destinys Child, Beyonce, Prince, Tom Jones, Spice Girls, 98 Degrees, Whitney Houston, Britney Spears and Lit. Mais Qui! Pacifique is the studio of choice for many name artists, producers and mixers with number-one hits and 100's of gold and platinum albums - all recorded and/or mixed in its two studios dubbed East and West. A full service recording facility, the Deranteriasian Bros offer the utmost in modern world class recording technology - in fact the only two 96-channel SSL XL 9000 K series consoles you can find under one roof in the US! Impressive outboard gear includes the mixers' standards plus Avalon and API 550A EQ's and compressors, Neve 1073 mic Pre's, GML, Manley and Eventide, to highlight a few items. Pacifique's mic locker stashes engineer favorites: Sennheiser 441, 421; AKG C12VR and 414, Scheops , EV and Neumann M149, TLM170 pair of U87's and KM84's to name a few. 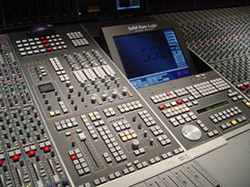 No studio would be complete without DigiDesign's ProTools 5.1 Mix Plus system, and ProTools HD fully loaded. Both studios offer ProTools. Maintenance? "with two brand new consoles, there's hardly down time at Pacifique, but we keep a professional staff to help with technical support," says Joe. 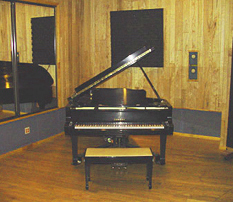 The tracking room (25'X25') offers a Yamaha C7D Piano. Most recently the studio hosted Prince who self-produced music for his upcoming release as well as music for the tour. Stew Young engineered the sessions. Prince to offer CD at concert. Prince fans who buy tickets to upcoming concerts on his 38-city tour will get to take home his new CD, Musicology. The singer, who will be inducted into the Rock and Roll Hall of Fame on March 15th, begins his first arena tour in six years on March 29. 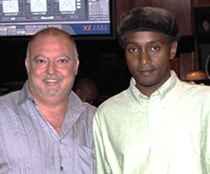 L-R: Joe Deranteriasian with Dexter Simmons who mixed Beyonce at Pacifique West. 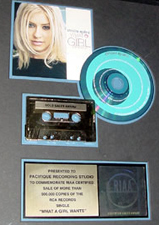 Ron Fair proudced Christina Aguilera's Genie in the Bottle with Dave Way mixing in Pacifique Studio West. Destiny's Child "Say My Name" from the Writing's On The Wall (Top 10 hits on the Billboard R&B singles and earned Destiny's Child the NAACP Image Award for Outstanding Duo or Group presented on March 1, 2001) and Brandy's album The Boy is Mine were both recorded and mixed at Pacifique. Also recorded at Pacifique, soundtrack to Men In Black I and II with Will Smith and engineered by Rob Chiarelli. Other notable producers who have worked at Pacifique include: Stephen Stewart Short, Guy Roche, Dexter Simmons and Rodney Jerkins, to name a few. 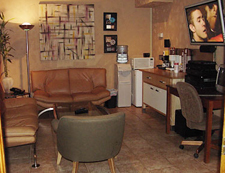 Each studio is connected to a private living room with bathroom, telephone and flat screen TV/Video/Internet, a mini kitchen -for the do-it-yourself cooks- and an entertainment room. "However, most recording crews prefer to concentrate on recording and ask us to take care of the catering, which the staff is happy to do," says Joe. "Pacifique is embraced by top notch clients mostly because of our knowledgable and helpful staff. We pay attention to detail and have a musician-friendly vibe," adds Joe with a big smile.